Vigo is situated in northwest Spain and is the biggest city in Galicia, as well as one of the fastest growing cities in Europe. The strategic natural port has been the making of Vigo, and has been in use since Roman times; the city retains a strong maritime flavour and lures tourists with unspoilt beaches, old fishing districts, coastal fortifications, boat trips, and spectacular seafood. The partially preserved fortifications of the city, built in 1656 to prevent Turkish invasion, can be viewed at sites like the Castro Fortress, which is now surrounded by gardens and offers spectacular views over the port it once defended. The city's historical quarter (Cidade Vella) centres on the old maritime neighbourhood of O Berbes, near the port, where a labyrinthine network of narrow streets reveals hidden historical gems, including the Collegiate Church of Santa Maria, built on the remains of a Gothic church said to have been burnt down by Sir Francis Drake. 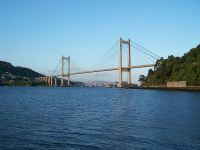 The main attraction of Vigo, however, is the coastline itself: the Vigo estuary is blessed with numerous white, sandy beaches, many of which are Blue Flag accredited and connected by pretty coastal walking trails. The bustling port offers ferries to nearby towns like Cangas and Moana, and boat trips are available to the unspoilt Cies Isles, rugged islands with pristine beaches that form part of the National Park of the Atlantic and are home to thousands of migratory birds.